The Gulf Stream is a warm, global current flowing from the tropics to the North Atlantic, its width ranging from 50 – 200 km (NOAA). The Coriolis effect largely determines the patterns, paths, and eddies that the Gulf Stream creates. These eddies move clockwise in the northern hemisphere and counterclockwise in the southern hemisphere. Gulf Stream energy has much more potential than wind energy does on the East Coast. Below is a photo of an assessment of the United States’ wind power and the potential amount of wind power that can be harvested, demonstrated in a scale of 1-7. Based on the image, there is little to no wind power potential in the Southeast (Web Design Studio, 2012). Because wind power potential is so low in the Southeast, let alone an intermittent source, Gulf Stream turbine installation offers an alternative source of renewable power that is consistent and substantial, providing a steady flow of electricity (WDS, 2010). Here is another hypothetical design for a Gulf Stream current turbine. The simple design allows for easy maintenance and operation, with little to no servicing required. There would supposedly be no problems with biofouling because the turbines would be located in the Gulf Stream. Constantly moving waters would not enable eggs or spores to attach themselves to the turbines (WDS, 2010). These turbines would be able to float and drift with the current as they collected energy, and they would be anchored to the seafloor. 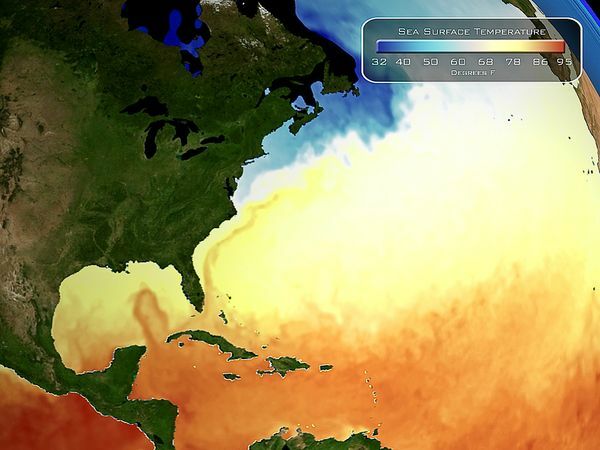 The Gulf Stream holds enormous potential for ocean current energy for the United States (Salisbury, 2012). It flows from south Florida along the East Coast and diverts east from the North Carolina coast at Cape Hatteras (NOAA). The average rate of flow is 5.6 miles per hour, and it flows fastest at the ocean’s surface (Salisbury, 2012), with speeds reaching up to 2 m/s. Studies show that the Gulf Stream varies seasonally – during the fall, it shifts direction towards the north and in the winter and spring it moves southward (North Oceanographic Partnership Program (NOPP)). Florida Atlantic University (FAU) is making progress towards harnessing the Gulf Stream’s energy with a project that will test the amount of power that can be captured from this large resource. FAU’s College of Engineering and Computer Science has applied for a lease from BOEM to anchor a group of small turbines in the Gulf Stream about 15 miles from Fort Lauderdale. FAU applied for over 17,000 acres of ocean floor to test and operate these turbines – so far, BOEM has found no significant potential issues with the project (Salisbury, 2012). At first, a single turbine will be installed, attached to a floating buoy. If successful, several larger turbines will be put in place with a more permanent infrastructure (Salisbury, 2012). Susan Skemp, FAU center’s director, urges that the Gulf Stream will be an dependable source of power in the future: “It’s consistent, and it’s 24-7. It’s continuously moving” (Salisbury, 2012). Below is a concept image representing the turbines that may be installed off the coast of Florida. Salisbury, S. (2012, June 9). FAU project aims to harness the energy of the Gulf Stream. The Palm Beach Post.